Nellie Melba – Australian operatic soprano. 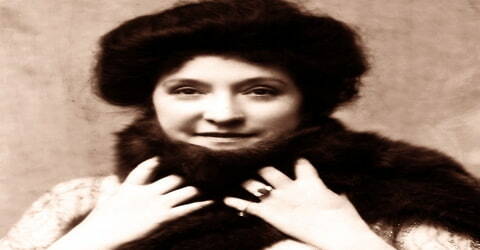 Australian coloratura soprano, a singer of great popularity, Nellie Melba was born on May 19, 1861, in Richmond, Victoria, Australia the eldest of seven children of the builder David Mitchell and his wife Isabella Ann née Dow. 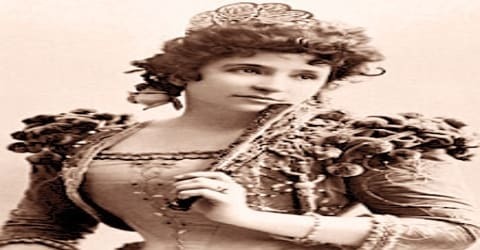 She became one of the most famous singers of the late Victorian era and the early 20th century and was the first Australian to achieve international recognition as a classical musician. She took the pseudonym “Melba” from Melbourne, her home town. She adopted the alias ‘Melba’ after her home town, Melbourne. She was the first Australian to achieve global success as an opera singer. Her shows were conducted regularly at Covent Garden in London and at the Metropolitan Opera in New York. Early in life, she studied singing in Melbourne. However, following an unsuccessful marriage, she traveled to Europe to establish her singing career. After an initial period of struggle and further studies in Paris, she became the leading lyric soprano at Covent Garden, London. Gradually, she became famous all over Europe and performed at the Metropolitan Opera, New York. In the span of her career, she sang for around 25 roles. Apart from being a wonderful singer, she was also fairly charitable and collected funds during the First World War. During the early 20th century, she returned to Australia to sing in operas and teach music at the Melbourne Conservatorium. She sang and made ‘farewell’ appearances till her last days. Her death was mourned by admirers all over the world. Undoubtedly, she was an exceptional coloratura of her time and one of the biggest icons of the early 20th century. Melba was active in the teaching of singing at the Melbourne Conservatorium. Melba continued to sing until the last months of her life and made a large number of “farewell” appearances. Her death, in Australia, was news across the English-speaking world, and her funeral was a major national event. The Australian $100 note features her image. 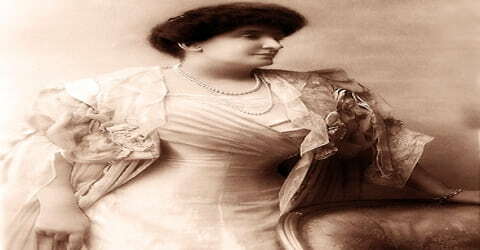 Dame Nellie Melba, original name Helen Armstrong, née Helen Mitchell, was born on 19 May 1861, in Richmond, Victoria, to builder David Mitchell and his wife Isabella Ann née Dow Mitchell. Melba was the eldest surviving child of the family and had seven younger siblings. Right from childhood, she received piano lessons. She studied singing with Mary Ellen Christian and Pietro Cecchi and received her education at a local boarding school. Later, she studied at the Presbyterian Ladies’ College. Her first public performance was at the age of six. In her teens, Melba continued to perform in amateur concerts in and around Melbourne, and she played the organ at church. Her father encouraged her in her musical studies, but he strongly disapproved of her taking up singing as a career. Melba’s mother died suddenly in 1881 at Richmond. The family eventually shifted to Mackay, Queensland, where her father built a new sugar mill. Soon after, she became popular in the region for her musical skills. After a short unsuccessful marriage to Charles Armstrong, she decided to pursue a singing career and debuted professionally in 1884. She was assisted in organizing her concerts by flautist John Lemmone, who became a ‘lifelong friend and counselor’. 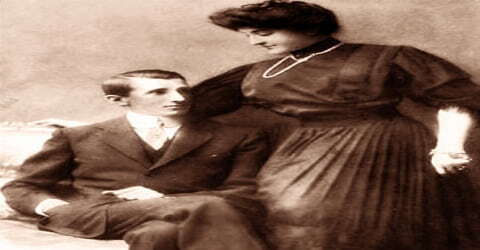 On 22 December 1882 in Brisbane, Nellie Melba married Charles Nesbitt Frederick Armstrong (1858-1948), the youngest son of Sir Andrew Armstrong. They had one child, a son, George, born on 16 October 1883. The marriage was not a success; Charles reportedly beat his wife more than once. The couple separated after just over a year, and Melba returned to Melbourne determined to pursue a singing career, debuting professionally in concerts in 1884. In the early 1890s, Melba had an affair with Prince Philippe, Duke of Orléans. When spotted together frequently, Charles filed for a divorce on the grounds of adultery, accusing the Duke as well. Although Charles eventually withdrew the case, the scandalized Duke left for a two-year African safari without Melba and their relationship faded out. Charles and Melba finally divorced in 1900 in Texas. Considering her success in Melbourne, she traveled to London in search of better opportunities. Her debut at the Princes’ Hall in 1886 made little impression, and she sought work unsuccessfully from Sir Arthur Sullivan, Carl Rosa, and Augustus Harris. She then went to Paris to study with the leading teacher Mathilde Marchesi, who instantly recognized the young singer’s potential: she exclaimed, “J’ai Enfin une étoile!” – “I have a star at last!”. Melba made such rapid progress that she was allowed to sing the “Mad Scene” from Ambroise Thomas’s Hamlet at a matinée musicale in Marchesi’s house in December the same year, in the presence of the composer. 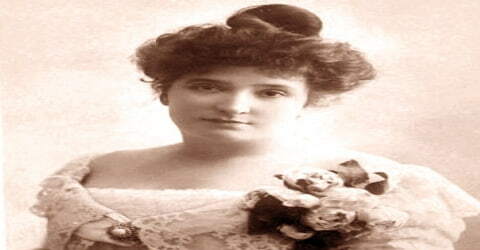 Nellie Melba then went to Paris to study with Mathilde Marchesi, who immediately recognized her talent. She made rapid progress and within a year, impresario Maurice Strakosch assigned her a ten-year contract at 1000 francs annually. Almost immediately, she received a better offer of 3000 francs per month from the Théâtre de la Monnaie, Brussels. However, Strakosch restrained her from accepting it. She finally regained her freedom when Strakosch suddenly expired. Melba made her operatic debut four days later as Gilda in Rigoletto at La Monnaie on 12 October 1887. The critic Herman Klein described her Gilda as “an instant triumph of the most emphatic kind … followed … a few nights later with equal success as Violetta in La Traviata.” It was at this time, on Marchesi’s advice, that she adopted the stage name of “Melba”, a contraction of the name of her home city. 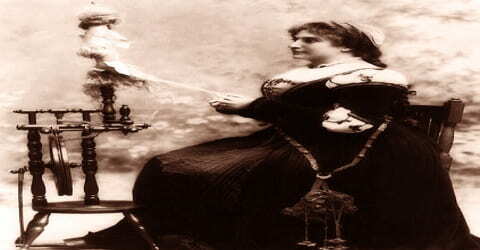 In May 1888, Melba debuted in London’s Covent Garden in the title role of ‘Lucia di Lammermoor’. Her performance received a luke-warm response. Snubbed on being offered a smaller role in the following season, she left England. In 1889, she performed in the role of Ophélie in Hamlet at the Opéra in Paris. Soon, her strong ally in London, the influential Lady de Grey begged her to return. She consented and was cast in ‘Roméo et Juliette’ at the Covent Garden. After this, Melba returned to Paris to perform the roles of Ophélie, Lucia, Gilda, Juliette, and Marguerite. Her pronunciation in French was weak, but the composer Delibes was satisfied with her singing. In the next few years, she performed in the top European opera houses of Milan, Berlin, and Vienna. From the 1890s, Melba played a wide range of parts at Covent Garden, mostly in the lyric soprano repertoire, but with some heavier roles also. She sang the title roles in Herman Bemberg’s Elaine and Arthur Goring Thomas’s Esmeralda. Her Italian parts included Gilda in Rigoletto, the title role in Aida, Desdemona in Otello, Luisa in Mascagni’s I Rantzau, Nedda in Pagliacci, Rosina in The Barber of Seville, Violetta in La Traviata, and Mimì in La bohème. In the French repertoire, she sang Juliette in Roméo et Juliette, Marguerite in Faust, Marguerite de Valois in Les Huguenots, the title role in Saint-Saëns’s Hélène, which was written for her, and Micaëla in Carmen. In December 1893, Melba debuted at the Metropolitan Opera in New York as Lucia di Lammermoor. Her performance received a half-hearted response. However, her later performance in ‘Roméo et Juliette’ was successful and established her as the foremost prima donna of her era, in succession to Adelina Patti. Some writers expressed surprise at Melba’s playing the last of these roles since it was merely a supporting part in the opera. She played it on many occasions, saying in her memoirs, “Why on earth a prima donna should not sing secondary rôles I could not see then and am no nearer seeing today. I hate the artistic snobbery of it.” She sang the role opposite the Carmens of Emma Calvé, Zélie de Lussan, and Maria Gay. Marguerite de Valois, too, is not the leading female role in Les Huguenots, but Melba was willing to undertake it as seconda donna to Emma Albani. She was generous in support of singers who did not rival her in her favored roles, but was, as her biographer J. B. Steane put it, “pathologically critical” of other lyric sopranos. Melba appeared in Sydney in 1885 and in London in 1886 and then studied in Paris. She made her operatic debut as Gilda in Verdi’s Rigoletto in 1887 at Brussels under the name Melba, derived from that of the city of Melbourne. Her Italian roles were Gilda in Rigoletto, Desdemona in Othello, Nedda in Pagliacci, Violetta in La Traviata, Mimi in La bohème, etc. Likewise, her French roles were Juliette in Roméo et Juliette, Marguerite in Faust, the title role in Saint-Saëns’s Hélène (written for her), Micaëla in Carmen, etc. Some of these roles required her to play the second donna which she readily obliged. By the turn of the 20th century, Melba was a celebrity in Britain and America. 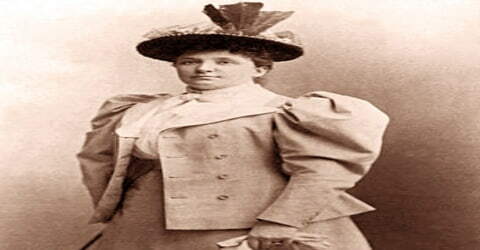 She first returned to Australia in 1902-03 for a concert tour and visited New Zealand as well. The profits were exceptionally high and she returned for four more tours later during her career. Melba performed 26 times at the Royal Albert Hall in London between 1898 and 1926. Although she called Covent Garden “my artistic home”, her appearances there became less frequent in the 20th century. One reason for this was that she did not get on well with Sir Thomas Beecham, who was in control of the opera house for much of the period from 1910 until her retirement. She said, “I dislike Beecham and his methods”, and he thought that while she had “nearly all the attributes inseparable from great artistry … she was wanting in a genuine spiritual refinement.” Another factor in her reduced appearances at Covent Garden was the appearance on the scene of Luisa Tetrazzini, a soprano ten years her junior, who became a great success in London and later in New York in roles previously associated with Melba. A third reason was her decision to spend more time in Australia. In 1909, Melba undertook a “sentimental tour” of Australia, visiting many far-flung towns. She also bought a property at Coldstream, a small town near Melbourne, and two years later built a home there that she named ‘Coombe Cottage’. Simultaneously, she also set up a music school in Richmond, which she later merged with the Melbourne Conservatorium. In 1911, she partnered with the J. C. Williamson Company for an operatic season in Australia. Melba was in Australia when the First World War broke out, and she threw herself into fund-raising for war charities, raising £100,000. In recognition of this, she has created a Dame Commander of the Order of the British Empire (DBE) in March 1918, “for services in organizing patriotic work”. After the war, Melba made a triumphant return to the Royal Opera House, in a performance of La bohème conducted by Beecham, which re-opened the house after four years of closure. The Times wrote, “Probably no season at Covent Garden has ever started with quite the thrill of enthusiasm which passed through the house.” In her many concerts, however, her repertoire was regarded as trite and predictable. Postwar, Melba made a triumphant return to the Royal Opera House, with a performance of ‘La bohème’. This re-opened the house after almost four years of closure. In 1922, Melba returned to Australia again and performed at the immensely successful ‘Concerts for the People’ held in Melbourne and Sydney. The tickets were low priced and attracted 70,000 people. In 1926, Melba made her leave-taking appearance at Covent Garden, singing scenes from Roméo et Juliette, Othello, and La bohème. Melba is well remembered in Australia for her seemingly endless series of “farewell” appearances, including stage performances in the mid-1920s and concerts in Sydney on 7 August 1928, Melbourne on 27 September 1928 and Geelong in November 1928. From this, she is remembered in the vernacular Australian expression “more farewells than Dame Nellie Melba”. In 1929, Melba returned for the last time to Europe before visiting Egypt, where she got a nagging fever. Her last performance was on 10 June 1930 in London, at a charity concert. She helped flourish the careers of several younger singers and taught for many years at the Melbourne Conservatorium, searching for a “new Melba”. Melba even published a book about her methods. Nellie Melba was made Dame Commander of the Order of the British Empire in 1918 for her charity work during World War I and was promoted to Dame Grand Cross of the Order of the British Empire in 1927. She was the first Australian to feature on the Time magazine cover, in April 1927. Melba is one of only two singers with a marble bust on the grand staircase of the Royal Opera House, Covent Garden London. The Melbourne Conservatorium was renamed the Melba Memorial Conservatorium of Music in 1956. Nellie Melba returned to Australia but died on 23 February 1931 in St Vincent’s Hospital, Sydney, aged 69, of septicemia which had developed after facial surgery in Europe sometime before. She was given an elaborate funeral from Scots’ Church, Melbourne, which her father had built and where as a teenager she had sung in the choir. The funeral motorcade was over a kilometer long, and her death made front-page headlines in Australia, the United Kingdom, New Zealand, and Europe. Billboards in many countries said simply “Melba is dead”. Part of the event was filmed for posterity. Melba was buried in the cemetery at Lilydale, near Coldstream. Her headstone, designed by Sir Edwin Lutyens, bears the farewell words of Mimì in La bohème: “Addio, senza rancor” (Farewell, without bitterness). Her repertoire across her entire career is 25 roles, of which, only ten are closely associated with her. Her most frequent roles were Marguerite in Gounod’s ‘Faust’ and Mimi in Puccini’s ‘La bohème’, both of which she studied under the supervision of the composer. Her autobiography ‘Melodies and Memories’ was published in 1925 and mostly ghost-written by her secretary Beverley Nichols. A novel Evensong by Nichols (1932) was based on aspects of Melba’s life, drawing an unflattering portrait. The 1934 motion picture adaptation of Evensong, starring Evelyn Laye as the character based on Melba, was for a time banned in Australia. Melba appears in the 1946 novel Lucinda Brayford by Martin Boyd. She is depicted as singing at a garden party thrown by the mother of the eponymous heroine when she is described as having the “loveliest voice in the world”. Her name is associated with foods such as Peach Melba, Melba toast, etc. created in her honor by the French chef Auguste Escoffier.